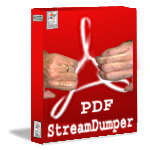 PDFStreamDumper is a free, open source tool to analyze malicious PDF documents. Application interface also includes specialized tools that allow you to analyze shellcode, decompress files, perform various brute forces and more. See the download page for more details.